Battles in the Age of War (BAW) is a set of wargames rules designed for Samurai Warfare in the Sengoku period between 1467 – 1650. They were written in 2008 and are published by Peter Pig. The rules are 136 pages long, perfect bound and are black & white with a full colour soft cover. They are from the same RFCM (Rules For the Common Man) team that developed Bloody Barons, Regiment of Foote and Civil War Battles and share several commonalities with these other rules. One of the interesting things is that Ashigaru units can have mixed bases, so can consist of a mix of spear/arquebus or spear/bow. Armies are built to a points limit, with each base having a cost. Examples of Peter Pig counters – these figures denote challenges won. BAW is designed to be played on a 5′ x 3′ table. In addition to your armies you will need a ‘choice’ dice (or you can use a standard D6), around 25 D6, some mini-dice, a 12-inch ruler or a measuring tape, 4-5 pieces of scenery for each player, some markers to denote disorder, casualties, challenges won and if unit won its last fight. There are a number of pre-battle activities that are performed. These include placing of scenery, deciding the quality of the generals in your army, deciding the attacker and defender, deploying troops and going through a series of pre-game events. For each of these events, both players roll the number of D6 they have allocated to it, with a success being a roll of a ‘5’ or ‘6’. Whoever has the most successes in Attacker/Defender becomes the Attacker in the game. For each of the other events, compare the number of successes rolled – the winner of each event may have something beneficial to him happen before the battle. When deploying their army, players may choose from a number of formations, as Japanese armies had fairly rigid battle formations. The deployment zone of an army is divided into nine areas – an army can deploy up to 12″ onto the table, but the table is divided into three sectors: left, center, right – each on 20″ width. Each sector deployment area is sub-divided into 3 bands: front, middle, back – each of 4″ depth. An army is divided into 3 clans (two for short battles), and each clan is deployed in a sector. Depending upon the formation chosen by the player, only certain units can be placed in each of these bands. BAW has an IGO-UGO turn sequence. The attacker goes first. On a players turn, each of his generals may attempt to motivate the units under his command – much in the same way as you would in a game of Warmaster or Black Powder. The player rolls 2D6, and has to score higher than a number determined by the quality of the general, the type of unit (Samurai are easier to order than Levy) and how far the unit is away from the general, plus whether there is cover or another unit intervening. Should the motivation succeed, that unit has 1D6 action points to use that turn. Should the motivation fail, the general can issue no further commands that turn and each unit that has yet to be ordered in the generals clan receives a single action point. Messengers were an important part of the battle in the Sengoku period, and in BAW, they can be used by the player to give clan generals a number of ‘Determination Dice’ on his turn. These can be used to reroll motivation roll for a unit, or reroll the number of action points a unit gets in its turn. It costs 1AP to shoot a bow, 2AP to shoot an arquebus or artillery. In addition, it costs 2AP to motivate a unit to ‘start a fight’, so a foot unit charging 3″ into the enemy would require 3AP. Units may shoot by spending Action Points when attacking, or they get a free shooting action if an enemy approaches within 4″. Maximum range for bows and arquebus is 10″, and the field of fire is a box that extends straight ahead of the unit. The player rolls 1D6 for each base that is eligible to fire, and scores a hit on a ‘6’ (‘5’ or ‘6’ if the firing unit’s centre-line touches the target.) Hits are distributed evenly amongst the target unit bases. Target bases have a saving throw, which is 3-6 on 1D6. This can be modified, but 4-6 always saves and ‘1’ always fails. Bases that fail their save are replaced by casualty markers. Fights (melee) only occur once all units have been ordered. Dice are rolled simultaneously for both sides. Each side rolls a number of D6 equal to the number of bases in the unit, adjusted by several modifiers. Rolls of 5 or 6 score a hit. These are allocated amongst the target unit, and then saving throws are made. Whichever unit causes the most casualties is the winner (if you manage to wipe out your opponents front rank, they automatically lose). The rules cater for multiple units in combat. If a unit loses a combat, it must perform a morale check. Several D6 are rolled, depending upon the state of the unit (unit type, how many casualties it has suffered, whether its commander has been killed etc) – each roll of 4,5 or 6 causes a morale failure. The number of morale failures denote what happens, from not being able to move to routing from the table. Once a morale check has been taken, all casualty markers are removed from the unit. Once all fights have been completed the player whose turn it is may issue a single challenge. Unit commanders can challenge other unit commanders, and generals can challenge other generals or unit commanders. Challenge can be refused, but causes loss of a unit base and disorder (generals become poorer quality). This is an interesting push-your-luck mechanic. Players alternate rolling 1D6, adding to their score each time. After each round, if one player exceeds the other players score by ‘3’ or more, they have killed the opponent. If, however, you exceed your ‘threshold’ (usually 12) you are killed. Players can stop rolling dice at any point. Once the challenge phase is complete, on the defenders turn, he can check for forces arriving late to the battle, and then the defender deducts 1D6 from the countdown clock. The countdown clock starts at ’20’, and the game ends when it reaches zero, which gives a varying game length. Once the game is complete, victory points are tallied – these are scored by evaluating criteria (units routed/destroyed, bases killed, generals killed, challenges won, sectors of the battlefield controlled etc.) However, the majority of these conditions gives you a random number of victory points (1D6, 2D6 etc.) so your final number of victory points is not certain. Whoever has the greater number of victory points wins the game. BAW also contain rules for using 28mm models instead of 15mm, optional rules for Pavises, light defences and mixing bow and arquebus in the same unit and then has a whole section on fighting sieges. There are additional sections on the Ikko-ikki, and descriptions of famous characters of the period. There are also three small hobby sections, with details about basing, painting and making a gaming board. 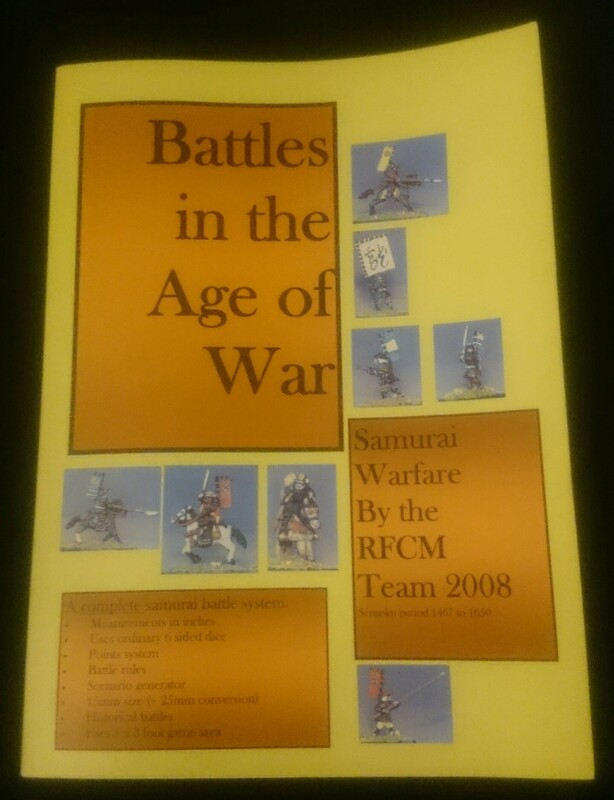 Battles in the Age of War certainly brings a huge amount of Samurai flavour to the wargaming table. The whole pre-game phase adds intrigue and strategy, whilst the use of fixed formations, messengers and challenges in the game helps to keep the period feel. Generals having to motivate their troops, and even then not being certain of just what they can do allows a good level of friction in the game, which is something of a must in my book. However, this friction can be somewhat mitigated by the judicious use of messengers, so a player can never really complain about simply losing because of poor dice rolling. Even the random game length is a winner in my book. The rules are pretty solid and easy to learn. After a couple of games the QRS should be all that you need for most of the game. Mechanically, I enjoy how modifiers usually add or remove dice, rather than simply adjusting dice scores (although this does happen in some cases). I question if missile fire is just a little too ineffective at times, but that’s a minor quibble. Random victory points? I’m not a huge fan of these, but again, a minor quibble. In my way of thinking the only thing that stops these rules from being near perfect is the fact that they still use IGO-UGO as the base turn sequence. You could amend the turn sequence so that it’s similar to Impetus, in that Clan Generals from attacker and defender alternately activate – I wonder how this may affect the game balance – it’s certainly a house rule I would consider using in future. All in all, I’ve been really impressed with Battles in the Age of War. It could well become my go-to set of rules for gaming larger battles in the Sengoku period. BAW, along with a comprehensive range of 15mm Samurai miniatures, is available from Peter Pig.